Travis Wyman will try to win the 2019 MotoAmerica Stock 1000 title on his Weir Everywhere BMW. 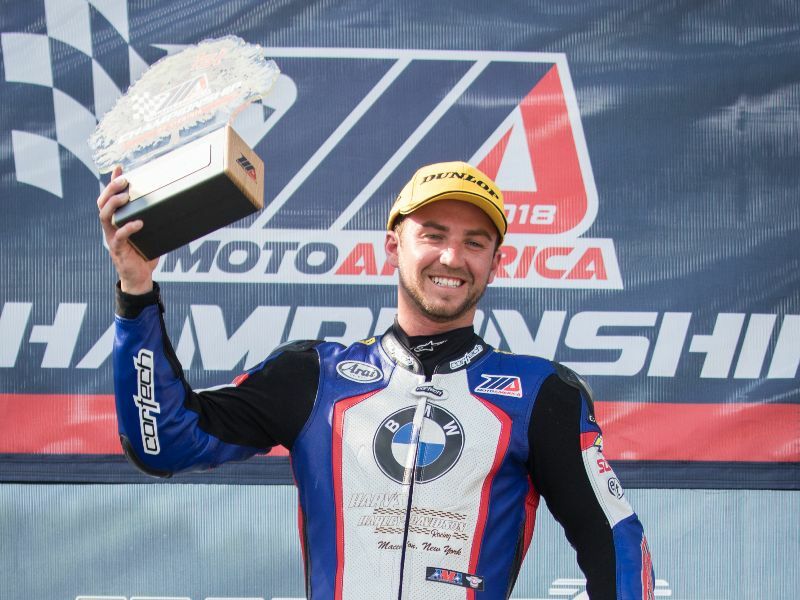 Last year’s runner-up in MotoAmerica’s Stock 1000 class has his sights set on the goal he came oh so close to accomplishing in 2018. Travis Wyman of Las Vegas, Nev., will again partner with the Weir Everywhere BMW team in an effort win BMW its first MotoAmerica title. The partnership enjoyed strong results in its first year of competition in 2018 and will aim to use the experience and data it has acquired from racing and off-season testing to capture the 2019 Stock 1000 Class Championship. “We’ve made some big strides with our BMW package during off-season testing, and we’re expecting even stronger results in 2019,” Wyman said. “Last year at this time, I had no experience racing a 1000cc motorcycle and had just started working with the team. We had three tests under our belt before we made our MotoAmerica debut. Wyman will again pilot a BMW S 1000 RR that will be tuned by BMW Motorrad North America HP Race Support Engineer Steve Weir, as well as Alex Torres of Fastline Motorcycle Performance in Fremont, Calif. In addition to competing in the Stock 1000 Class, the team also plans to demonstrate the prowess of its BMW package by competing in the MotoAmerica Superbike Class races at Circuit of the Americas in Austin, Texas, on April 12-14. The team welcomes back many of the sponsors, including Evol Technology LLC, Harv’s Harley-Davidson, Alpha1 Vinyl Works, Arai, SBS, Fastline Motorcycle Performance, MedAge, Drive Systems, MotoOption, LiteTech, Motul, Full Spectrum, Maxem, Orient Express and Cortech. The team also welcomes back the support of Wyman’s employer California Superbike School, which supplied the team with tires for its off-season testing program. To learn more about California Superbike School, visit superbikeschool.com. The team also has several title sponsorship opportunities available for select rounds of the 2019 season. Brand managers and business owners interested in using the team’s on-track success to promote their brand are encouraged to contact the team as soon as possible.